Becton Dickinson and Co (BDX) Position Boosted by Boenning & Scattergood Inc. Hoping for a smooth ride as the Christmas shopping seasonal rush comes to an end, Walmart is attempting to move more last minute shoppers over to its service of in-store pick up for orders online and push them to plan ahead. The world’s largest retailer on Tuesday said that shoppers could order an item through walmart.com up to 6 p.m. December 23 and would be able to pick it up at their choice of Walmart Supercenters anytime Christmas Eve the 24th. While Walmart has offered pick up in stores for a number of years, this marks the first year the retailer has pushed the service so hard, as it attempts in part to prevent stores from becoming overwhelmed by last-minute panic-stricken shoppers. Store pick up of orders made online is an important tool in the efforts of Walmart to battle with Amazon.com. Walmart has increased its number of online products by the tens of thousands that are available for same-day pick up from stores this shopping season. A typical Supercenter for Walmart will have more than 120,000 items, but the company will not give out exact numbers for the amount of those that can be picked up at a store following an order online. In October, Walmart said it expected its in-store pick up offer to increase five-fold during the holiday season. Although, Walmart does not break out the amount of its business online that is picked up at its stores, it is becoming a larger part of any e-commerce business of a retailer. Target executives in October said that over 35% of the company’s orders online are picked up at stores. Stores give retailers that have brick and mortar locations a much needed edge against online giant Amazon as the season winds down since they are able to serve customers through the end of the working day on the 24th, while Amazon can only offer same-day delivery on a limited number of items in an even smaller number of markets. 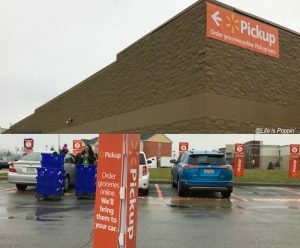 So that things run smoothly, Walmart is going to have a department manager from its pick up area at every store and workers in that area of the store received special training to speed the process of the pick up service. Walmart has also set up a website that is dedicated to listing items that are available for pick up in stores over the final few days prior to Christmas to improve on the process as well. Winslow Evans & Crocker Inc. Acquires 1,974 Shares of Micron Technology, Inc.